Buying And Selling To Make Money - Sharing My Day to Day Strategies for Buying and Selling to Make Money - Yardsales, eBay, CraigsList, Auctions, etc. One of the things that I look forward most to coming to Florida in the winter (other than fishing and playing softball) is going yard saleing. I’m guessing that’s pretty obvious though! The thrill of the hunt! It’s fun – even though it can sometimes be frustrating when I don’t find anything awesome to resell. Kath and I talk sometimes about how I’d still go out even if I never had to earn another dime from selling on eBay. I think I’d buy more selectively, but I’d still “have” to go! Anyway, in this video I share the first yard sale haul of the winter (2018-2019) season! In this particular weekend, Kath went out to a local sale on her way back from working out, and found the Harley manuals. Those might be the find of the weekend! If you head over to my YouTube channel, I’d love it if you would subscribe – and you will get a notification whenever I post a new vid. I know it’s not always the most exciting stuff, but you just never know when you’re going to find something cool. If you’re working on trying to figure out what to sell on eBay or Amazon or wherever, here are a couple of small ideas that might help you. It’s one thing to HAVE something to sell (e.g. your grandma’s old doll or your sister’s old clarinet), it’s an entirely different thing to actually SELL it. Perhaps you’ve read some of my history here at the site, but if not, I’ve been an eBay seller since 1999. It almost doesn’t seem possible, but it really has been nearly 20 years as of this writing. As I’ve mentioned in other posts, back then you could sell just about anything. It’s a different game these days. While my wife and I sell things at live auctions and occasionally on CraigsList, eBay is still our primary outlet. I’m just far more “picky” these days about what I’m going to sell! First, I look to see if there are any similar items currently offered. Second, I look at “Completed” items and see how many auctions or Buy-It-Nows have already closed. Third, I look at the “Sold” category to see how many of these things actually sold, and for how much. Forth, I look at the sell-through ratio. If there are 100 similar items currently up for grabs, and there are 80 similar items that have already closed, and there was a sell-through rate of over 50%, it might be worth getting. As long as the price is right. If it’s worth further consideration at all – and that depends on if there is a high enough sell-through rate. If the price the I have to pay leaves me enough potential profit margin (remembering to take selling and shipping costs into consideration). This could be helpful when you are determining what might be viable to sell. And, if you were thinking of starting a drop-shop site (instead of selling “old” stuff on eBay, for example), while you’re contemplating products, you can run some quick search checks to see if anyone is actually searching for them. It also helps when determining how to create titles in eBay for what you might be selling. But, let’s say that your sister’s clarinet is a Selmer Clarinet? 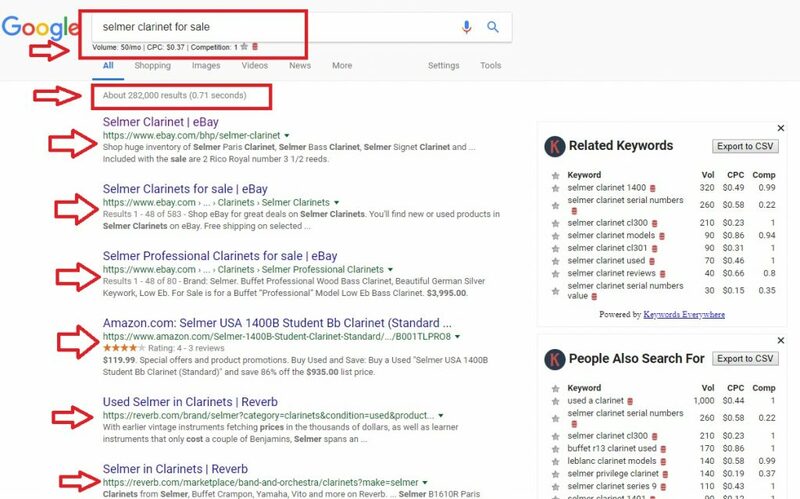 As you can see from the next screenshot, while there are far fewer people searching for THAT brand of clarinet, there is also less competition in the search results. AND, you will notice that an eBay listing comes up right at the top of the results. So does an Amazon listing. So does a “Reverb.com” listing (Reverb.com is a GREAT place to sell musical instruments and also vinyl records these days. They also have very reasonable selling fees. That may be something to think about if you have musical instruments to sell.). When it comes to selling, these sites all have a lot of authority in Google’s eyes, and so they tend to rank highly. This information can also be quite handy when you are trying to determine what to sell if you are considering drop-shipping. 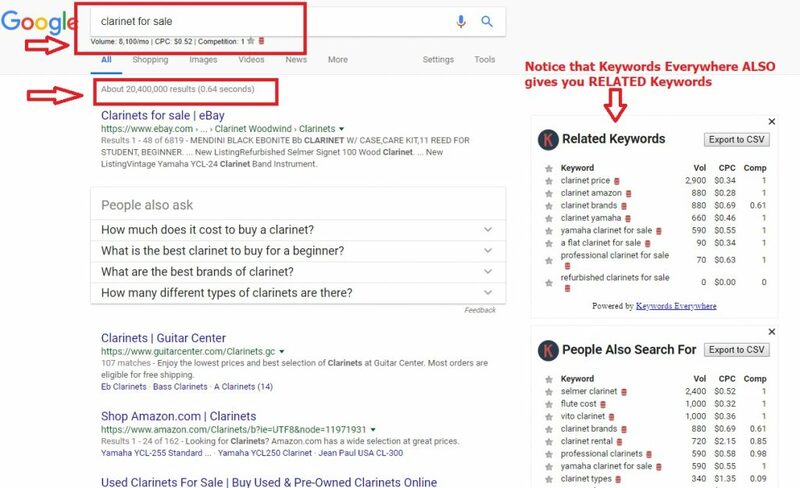 So, you can use that cool little Keywords Everywhere tool to see if anyone is even SEARCHING for things that you are finding at yard sales or thrift stores. If no one is searching at all, I’m not saying don’t buy it to re-sell, but just be careful to not overpay. If you are considering drop-shipping, you really do need to do a lot of market research to ensure that you aren’t chasing a dead-end market. And, if you are new to it, and don’t have a site with a lot of authority, you may have difficulty ranking above the “big guys” like eBay and Amazon. This is one reason why a lot of people use eBay to run their drop-ship operation instead of starting their own websites. Now, if you are looking at the drop-shipping model, you’ll want to do a LOT more in-depth research. One of my wife’s colleagues found some really nice looking cell-phone covers to sell via drop-shipping. She started up a nice Shopify site and added the product line and away she went. Everything looked great. But, there was only one problem. A gajillion other people were selling the same cell-phone covers. So, you need to understand your competition before you jump into drop-shipping. There are a few good places to learn about this business model, and there is also a pretty decent platform that I wish we had known about when my wife was a drop-shipper. 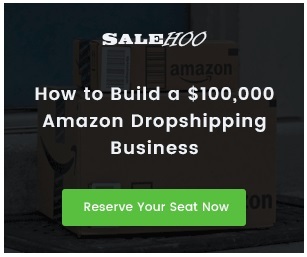 Before you begin signing up to sell ANY product via the drop-shipping model, learn about it. 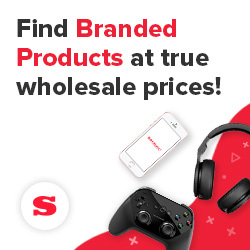 Both Shopify and Inventory Source have some good information on their sites. I can’t teach it, because that was my wife’s specialty. I can tell you this, she worked for weeks learning how to properly run a drop-ship business before she ever posted a single item for sale. There weren’t as many platforms available as there are now, and she had to do an enormous amount of loading product information manually into her website. A lot of that has been greatly simplified now. 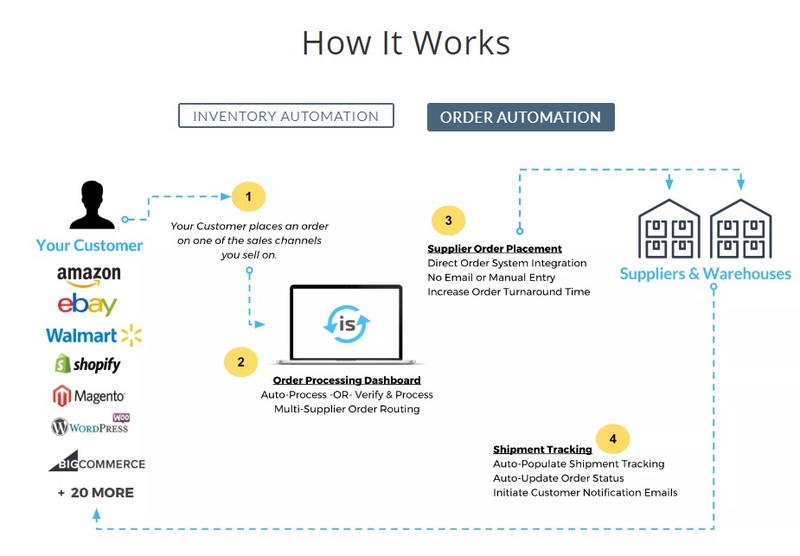 Just looking at the Inventory Source platform, for example, you can see from this screenshot a very brief overview of how they work. One thing that my wife has found that she really enjoys is finding products that are just a little “offbeat” enough that they DO have search volume (that is, people ARE searching for it), and that the entire world isn’t promoting. It takes a LOT of work to research this type of stuff, but she has fun with it. The point is, you’re going to need to do a lot of research, and learn the business! Anyway, I went on far longer than I thought I would. But, I do hope that the Keywords Everywhere and drop-ship info has helped, if only a little! While we were putting together our latest video (below), it stuck me about how some of the easiest things to sell on eBay are those that are useful and/or necessary to the buyer. When I first began on eBay, pretty much anything would sell since internet marketing (and eBay) was still in its infancy. Demand was higher than the supply at the time, and of course today it’s just the opposite. Actually, that’s not entirely true. But overall, with the exception of truly rare items you’ll find an overabundance of just about everything these days. I still love offering scarce items. But, it’s called “scarce” and “rare” for a reason – I don’t stumble across one-of-a-kind pieces every day. The things I do seem to find more often include everyday, “useful” stuff. As I mention in the video, I happened upon an estate sale that was organized by the family of someone who had evidently been a hoarder. There were a lot of happy dealers at that sale, including me. I noticed that a lot of people were walking right by a lot of glucose test strips – the strips that people use to test their blood sugar. These things can be expensive, and if someone needs one box, they’re going to need a bunch of them. I bought the entire lot for next to nothing. Maybe $10 or so. Within a couple of days of having listed them, someone bought them for $240. The buyer saved some money; I made some money. Everyone is happy. New Old Stock: DEFINITELY Some of the Easiest Things to Sell on eBay! I love buying “new old stock”. For those of you who don’t know what that means, it refers to stock that is still considered “new”. That is, it was never sold or used, and is in its original packaging. Sometimes, a store goes out of business and they need to liquidate their inventory. I don’t even have to know what it is (necessarily). If I see something still in its blister pack and it has a $40 price tag on it and I get it for $2, I’m a happy guy. You don’t need to only check eBay to see what something is going for. You can also check on Amazon to see what a similar item is selling for. So, just think about that when you’re out and about. I’m not saying to bypass the antiques or jewelry, but keep your mind open to useful items that the average person is looking for. Some of easiest things to sell on eBay are often right in front of us and being ignored by other buyers. 19 Years Selling on eBay! I’ve been on eBay since January 1999 if you can believe that! It’s hard for me to believe sometimes, but this month marks 19 years that I first sold my first item on eBay. It was a 2-book set about the Wright Brothers. No picture; no template – just a brief description of what I had, and that was the start of it! Of course a lot of things have changed in 19 years – some good, some not-so-good. First, some of the good stuff. I have to say that one of the things that eBay did for me (us) that I’m most grateful for is that they made international shipping a whole lot easier than it was before. In the past, I had to do a lot of research about whether or not I could send certain items to certain countries. I had to fill out customs forms, work on figuring out the postage, etc. It made selling to customers outside the US really difficult, and sometimes I wouldn’t do it, depending on the item. Today, however, all I have to do is send my international purchases to an address in Kentucky, and eBay takes care of the rest. They seriously have made international selling a pleasure again! Of course, eBay is not without its faults. I still don’t like the fact that a seller cannot leave an honest negative feedback to a buyer; however, buyers have free reign on feedback. Also, buyers don’t always seem to understand that an item that is purchased through an auction is historically non-refundable. eBay tends to side with the buyer if they have buyer’s remorse. You can’t get away with that in a live auction – that is, at a physical auction house. You buy it, you own it. Period. And yet, through it all, eBay is still my selling venue of choice. I also buy a lot of stuff on the platform for my own use – both for business and for the household. I’ve looked at a number of different venues to sell my stuff, and I always wind up deciding to remain with eBay. What about selling on Amazon? Today, we all hear about selling on Amazon, and my wife and I both know people who do so, and many who do so with great success. Selling on Amazon isn’t something I’m ready to do myself, however, because the items that I typically purchase for resale seem to fit more into the eBay model. And, if I find that my item isn’t quite right for eBay, depending what it is (furniture or glass products, for example), I’m happy to offer it on Craigslist, or send it to live auction. We sell at small, local auctions, and we have also been venturing into selling at larger auction houses (e.g. 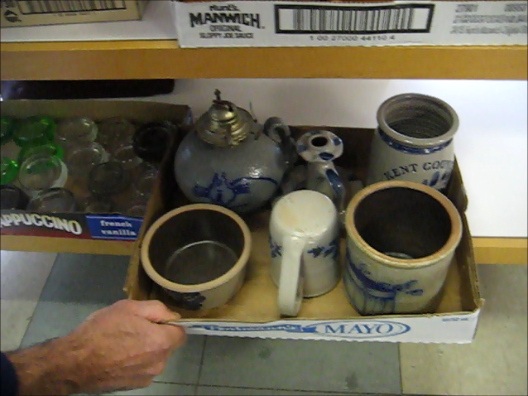 Swann Auction Galleries, where we’ve sent a few items). My busiest “eBay season” tends to be winter, because once my building and carpentry season ends up north, Kathy and I head south where I can yard-sale to my heart’s content, and find an almost never-ending supply of great things to resell in order to make my living while I’m away. Where I live in the north country of New Hampshire during the summer, as much as it’s awesome to drive around in the mountains and head down to the “big city” (e.g. 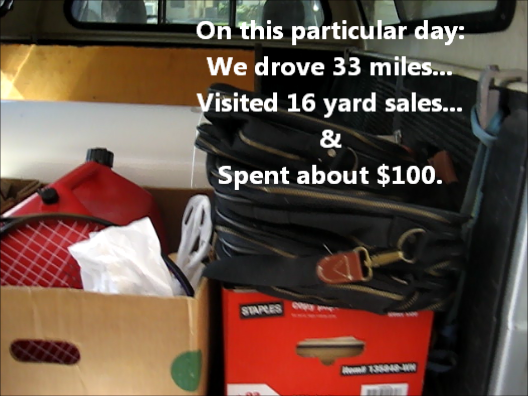 North Conway or Littleton or into Maine towards Portland), we can put over 100 miles on the car in a single day and make it to only 5-10 yard sales – sometimes a few more, but also sometimes hardly any. In Florida, I can drive around on any given Friday or Saturday morning, and hit 20 yard sales and drive less than 40 miles. That doesn’t include the dozens of thrift stores that are within a reasonable drive, and where I also find stuff to sell! Of course, it’s not in how many sales you hit, or how many miles you drive, but the results that matter. In order to show you results, I’ve got a YouTube channel where I do my best to document the stuff I find – whether it’s profitable or not! If you haven’t subscribed to my channel, I hope you’ll consider doing so! You can find me on YouTube at my “Johns Yard Sale Finds” channel at: https://www.youtube.com/user/JohnsYardSaleFinds. In the meantime, thank you for stopping by the website! I appreciate your visit. Here’s the video I just uploaded today to get the ball rolling! This vid shows the results of Friday’s yard sale haul! 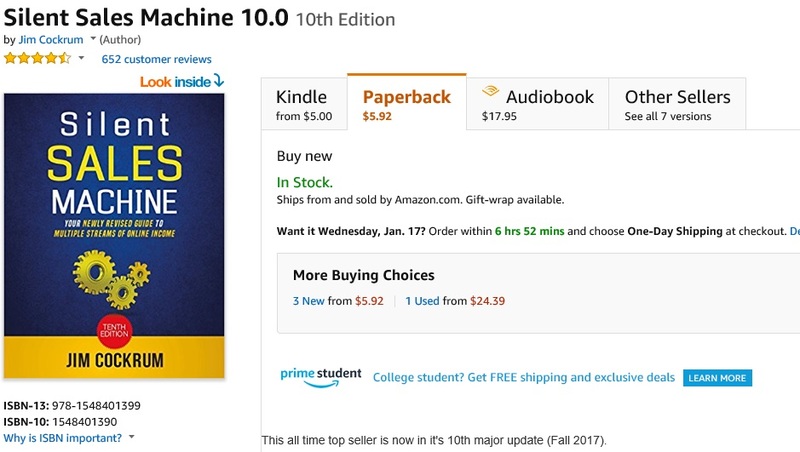 I just saw a book on Amazon by Jim Cockrum called “Silent Sales Machine.” It was updated in the fall of 2017, so it’s up to date. Now, I’m not a guy who gets too cranked about anything – but I have to say that for only $5.92 – yeah, that’s right – less than 6 Bucks – you’re going to get a TON of value. Silent Sales Machine is available in either paperpack or a Kindle ebook. You need to know a little bit about Jim. He’s not a whole lot different from many of us. He had that entrepreneurial spirit just about bursting from the seams. Since you’re on this blog, I’m guessing that you know that feeling! For those of you who have been reading my blog or who know me from YouTube, you know that I’ve been a used and rare book dealer since – wow… I think the early 1980s. So that’s a long time. You also know I’ve been a seller on eBay since January 1999. I’ve had great success on eBay, and I’ve had so-so experiences as well. I’m always keeping my eyes open for new opportunities, and new ways to market my inventory. I was intrigued by Jim Cockrum and his book for a few reasons (and not just because it’s only $5.92!). First, you should know that Silent Sales Machine is not geared towards making money on eBay; rather, it’s about starting an Amazon business (and what NOT to do). But, even though Jim no longer gears his work towards eBay (Amazon has become his focus), there is nothing wrong with incorporating a few ideas we just learned from Jim Cockrum in our eBay business. Frankly, I’m not going to be going the Amazon route, only because I don’t have the energy for it at this point. But, for a lot of you, starting an Amazon business may be something you want to consider. If so, give this book a shot. If you can afford to buy a cup of designer coffee, you can probably afford $6 to get some new ideas. In fact, why not brew yourself a cup of coffee at home, and spend an hour or so reading Silent Sales Machine? The reviews are very good, and from what I know about Jim Cockrum over the last several years, he’s certainly worth listening to. To buy your copy of Silent Sales Machine by Jim Cockrum, CLICK HERE. Hey everyone! So, the carpentry season is done for 2012, and now it’s time for some serious buying and selling on eBay for the winter. Kath and I got in on Friday, November 30th and had a little touch-and-go while they tried to figure out why our condo didn’t have internet. We almost had to move, but fortunately the techs don’t give up easily. It turns out that it was a piece of broken equipment. We have since unpacked and stocked up on some food, and have gone out for some great lunches already (something we don’t get a lot of at home). I’ve already been to one auction, where I picked up some great stuff that I’m making you guys a video about. Stay tuned! That’ll be within the next week or so… Some of it has already been sold. We’ve gone yard-saleing once, this past Saturday, which was pretty good considering it’s just a couple of weeks before Christmas. But, no 18K gold cufflinks! 🙂 Nonetheless, we got a few items. Again, Kath will be filming some videos shortly. I have to say that it’s good to be back in the land of year-round yard sales. Up north, there’s a bit of withdrawal that comes with Columbus Day weekend. It’s like someone pulls the plug of a huge yard-sale inflatable lawn ornament. It’s great to be back in South Carolina. Oh – some of you might be wondering why we’re not in Florida like last year. Well, we couldn’t get an affordable place within walking distance of the beach. And here, we could. We not only are across the street from the beach, we also have tennis on site. It’s great. So I’ll have more for you soon! Here’s some Tips for Selling on eBay – Genre Auctions! I’d like to offer one of my tips for selling on eBay – especially since it’s still fresh in my mind. As mentioned in the last post, summer is really a difficult time for us to do eBay. Today, however, I want to talk about when it’s DEFINITELY worth your time to make the time to run some auctions. I’m really fond of what I call “genre” auctions. That is, I may have a really nice tennis racquet that I bought at a yard sale – but I’ll probably wait to run it on eBay until I’ve got about 4 or 5 of them. Then I’ll make up a template for the “genre” and copy/paste it into Turbo Lister. In the case of the softball bats, I play on a couple of leagues here in New Hampshire, and my team captain for the men’s league had a number of bats he asked me to sell. I did a little research on the bats, and it turned out that he had quite a few of them that were worth some bucks. Now, here’s one of my “eBay tips” that I personally adhere to – and I adhere to it now only after trial and error (and a lot of error). As difficult as it is to say “NO” to someone who asks you to sell something for them on eBay, in a lot of cases it’s really in your best interest to back away from such requests. My personal rule of thumb is that if I can’t make any decent money on the transaction, it’s just not worth my time and effort. Obviously, everyone is different. You may have a lower or higher profit threshold that you need in order to make it worth your while to list something for others. In my case, if I can make at “x-amount of money” AFTER all eBay and PayPal fees, I’ll consider it. It also has to have a track record of selling in the recent past. In the case of softball bats, these bats had a pretty good track record. I give my consigner 50% of the hammer price – right off the top. So, if a bat sold for $100, he gets $50. I get what’s left after my fees. So, he didn’t have just ONE bat – he had about 12 of them. Several were worth running on their own, and the others I just lotted up. I also happened to have a few bats of my own, so I just waited until I had a couple of rainy days, and then photographed them and listed them. Kath helps me a lot when I’m listing a lot of items at once because she can type really fast. As you can see from the photos accompanying this post, we did pretty well! The total take was about $700 in my buddy’s inventory (so, I sent him $350), and then I sold a couple of my own. My take – after fees (which were about $80 all told) was about $450. Not bad for a few hours of listing, and then a few hours afterwards answering questions, and then the tasks that have to be done afterwards (invoicing, follow-up, packaging, shipping). Here is another screen shot from a few of the other results – and Kath is going to make another video with some more indepth info about this particular genre as soon as we grab a few minutes for her to film the intro. So, definitely consider working in “genres” – it can save some time if you are “grouping” items, because oftentimes you can make a template. Hey all… I thought I’d drop in a just talk a little bit about summertime, eBay, and where I usually am this time of year. Because I’m not yet a millionaire (notice I say “yet” – because I’m still shooting for it! ), I need to work my carpentry business when the weather is good. It really is necessary – because while eBay provides us with a good income, it’s never a “sure thing” as my working by the hour during the summer is. And, right now, due to our circumstances, I need to go where the sure money is for now. But not to worry. Summer isn’t very long up here. Yard sale season lasts only from about Memorial Day through Columbus Day in October – so not a very long season at all. Whereas down south, there are yard sales all winter long; hence, good buying all winter. Or at least good buying in theory. One of the reasons we started heading down south for the winter was 3-fold: 1) my carpentry slows down to next to non-existent in the winter, 2) there is no yard-saleing in northern NH in the winter, and 3) my wife really benefits from more light in the winter than we get up here. Actually, I can’t say as I don’t mind that extra sunshine either. As an ice-climber, I’ve had many, many winters where my climbing partner and I would be gone long before sun-up, climb all day, and sometimes into the night – and then back long after dark. But as much as I loved climbing – and actually still do – there is something to be said for longer, warmer, sunnier days in the winter. Well, that has little or nothing to do with the topic here – but thought I’d throw it in. Anyway, just because I’m busy doing carpentry during the summer does NOT mean I’m not out there actively buying. In fact, I tend to do a LOT of buying in the summer, to more-or-less stockpile my inventory for the time when carpentry slows down and I can get back to buying and selling on eBay. If you take a look at this photo, this is my front porch. Much to my wife’s dismay, it gets more and more cluttered every week. We’re getting ready – and I mean this very seriously – to rent a storage unit. The house has beome more of a storage unit than a residence, and I guess it’s time to take care of that. Over in the lower left hand corner of the photo, you’ll see numerous boxes with some clothes piling out. We went to a yard sale in Maine and bought EVERYTHING they had – at least 1,000 pieces of BRAND NEW or NEARLY NEW baby girl’s clothes – not one single piece from a Wal-Mart. Every last bit of it was high-end. In that same lot, we got women’s maternity clothes – hardly used, a brand new crib bumper set from Pottery Barn (don’t know exactly what “Pottery Barn” is doing selling crib sets, but what the heck…), and also a bunch of Halloween costumes. We’re constantly buying backpacks (although the one you see in the photo is one of our friend’s packs), camping gear, snowshoes, cleats, and just about anything useful that people would rather buy used than new. So, even though I’m not listing right now, I’m buying! I WILL actually be listing a few items in the next week or so, only because the items are more likely to be purchased during the summer than winter, and if I list them, it will clear at least a little bit of inventory out of the house! Just wanted to pop in and give you the latest… stay tuned! When I’m home in New Hampshire during the summer, it is a rare Saturday morning that I’m NOT going to yard sales. Buying at yard sales has been an integral part of my buying and selling business for so many years now, that I’m not sure what a sunny Saturday morning would be like without going yard saleing! It has really just become a natural extension of my life. When we began heading to the southern US for these last few winters, it was great! I could yard sale my way through the entire winter with scarcely missing a beat. Up north, yard sales pretty much cease to exist once Columbus Day hits. When we were here in the winter, the best I could do would be to visit the few thrift stores and occasional group shop that would be open and within driving distance. Otherwise, I had to depend on the inventory I collected in the summer to sell during the winter. In heading south for the winter, I had to be judicious in deciding what to bring with us to get rolling on eBay as soon as we arrived at our winter rental. I really can’t afford to be without income for more than a week or so. Before we left, I pre-loaded a bunch of items for sale into Turbo Lister (the listing software for eBay) – all stuff I could carry down south with us that wasn’t too bulky. Then, all I had to do was “flip the switch” as it were, to start all the auctions running at once. This last winter, we arrived in Florida on Tuesday, November 22nd – just a couple of days before Thanksgiving. We took a few days to unpack, get the lay of the land, get stocked up on our groceries, and then Friday morning, I was out at a local flea market I’d located, as well as some yard sales. There weren’t a ton of yard sales that particular weekend, which is understandable since it was Thanksgiving weekend. But there were enough to get me out the door and driving around to learn the neighborhoods, roads, and where the “perpetual” yard sales tended to be. By “perpetual” yard sales, I mean the types where the homeowners are out there every single weekend, typically trying to sell the same tired old inventory that’s getting dustier and grimier with every weekend that they take the tarps off the peeling and bowing and delaminating plywood tables. Ok guys and gals… I just uploaded a new video over at YouTube (my username or channel or whatever you call it at YouTube is “JohnsYardSaleFinds” for lack of any better ideas). This video shows how we loaded up for a live country auction (as opposed to the virtual eBay auctions) up here in northern New England. We happened upon Blakely Jenkins who, along with his partner in the auction business Kirby Parker run a weekly auction in St. Johnsbury, VT (Jenkins Auction Service). In the video, we show EXACTLY how we lot things out – and you’ll see Blake’s reaction to our layout. We then show you the results of some of the items that we mentioned by name, along with the entire take at the end of the night. If you are going to be taking things over to a live auction, I can’t tell you how incredibly important it is to really take the time to lot out your items so that they are easy to display and easy to handle. 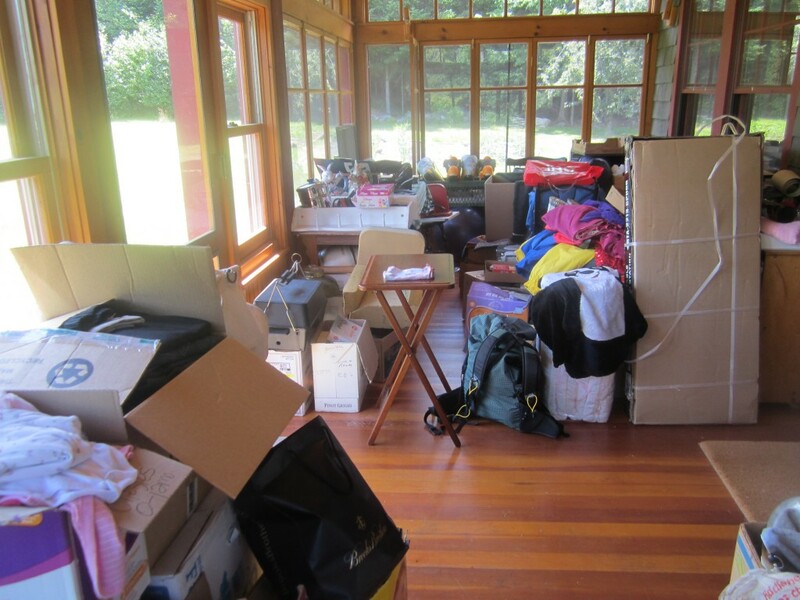 Think of how it is if you go to a flea market, yard sale or auction – isn’t it easier and more efficient for you to look at an item if it’s clean and laid out as though the seller really cares about it? Well, it goes a long way in auctions. One other thing – there are so many ways to sell stuff. As you can see from this video, eBay is definitely not the only way. Neither is Craigslist. Don’t forget about Amazon! You can learn a LOT about this from Skip McGrath, who has been at this at least as long as I have. 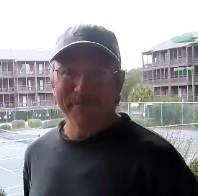 Check Out Skip McGrath’s Best-Selling eBook, “The Virtual Peddler” by Clicking Here Now!